Hello and welcome to Episode #28 of the Mother’s Quest Podcast that I’m bringing to you at the start of the Jewish New Year. The holiday kicks off a ten day period, known as the Days of Awe, between Rosh Hashanah and Yom Kippur, the day of Atonement. This time of year, regardless of your religious faith, is a season of reflection and renewal, as our children get settled into a new school year and the leaves begin to change color. 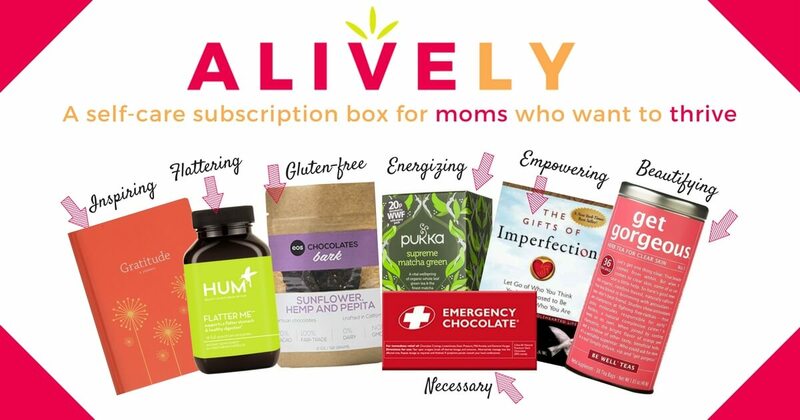 I wanted to take advantage of this time to turn inward and create an opportunity for change not only for myself but also for members of the Mother’s Quest Community. I decided to reach out to mindful mother, Edie Rafael Brotman, author of the book “Mussar Yoga,” to learn from her how she approaches self-improvement through blending the ancient Jewish practice of Mussar and the ancient Eastern practice of Yoga. Edie’s book was a trusted resource in a Mussar class I took a few years ago. 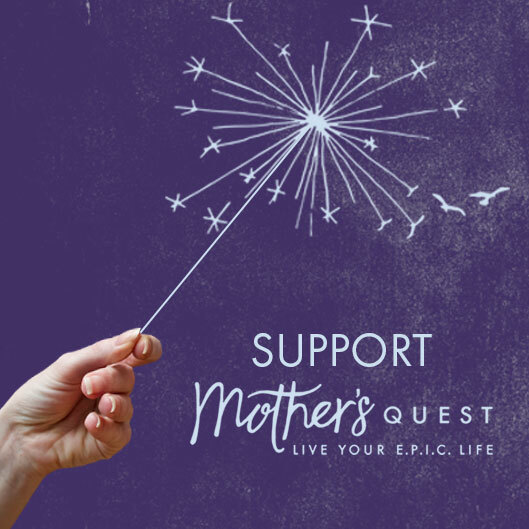 I was enthralled by the process and know that the experience planted seeds for Mother’s Quest. 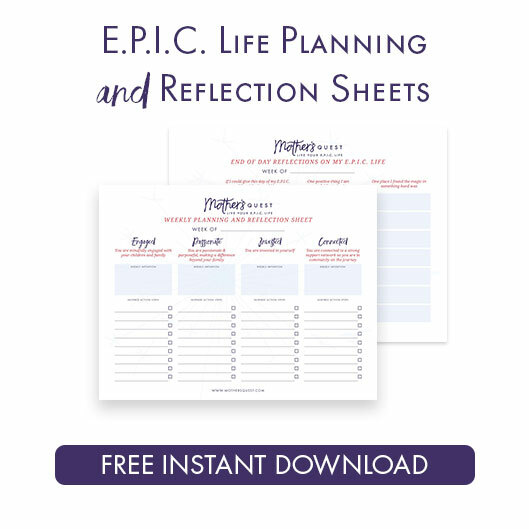 So, when I reached out to Edie to see if she’d share her approach on the podcast and then lead a 5 day challenge in the Facebook Group and she said “yes,” I was thrilled. Edie is a workplace consultant and coach for a business consulting firm called Rewire Inc that leverages emotional intelligence, mindfulness and communication. She has her PhD in Sociology and was an adjunct professor at UVA, Case Western Reserve University and Towson University. She’s also a highly trained yoga instructor, was named one of Baltimore’s favorite yoga teachers in Baltimore Magazine’s “Best of Baltimore” and co-founded Off the Grid Yoga and Camping Retreats. In this episode, Edie orients us to Mussar in which character traits, known in Hebrew as “middot,” are the centerpiece of the practice. Edie and I explore her E.P.I.C. life story, how she came to mindfulness and Mussar, and how reflecting on middot in her life has enriched her and her relationships. Edie also shares how her mother influenced her independence. And how her mother’s untimely death jump-started Edie’s journey to discover Mussar and connect it to Yoga as a bridge to connect Jewish spirituality and her love for physical activity. I appreciated so much about this conversation with Edie, especially the deep dive into the history of Mussar practice, and how she came to this connection between self-improvement, spirituality and the physical body. I’m so excited to continue the exploration of all of these things, and hope you’ll decide to come along too as we challenge ourselves together during this season of reflection and renewal. 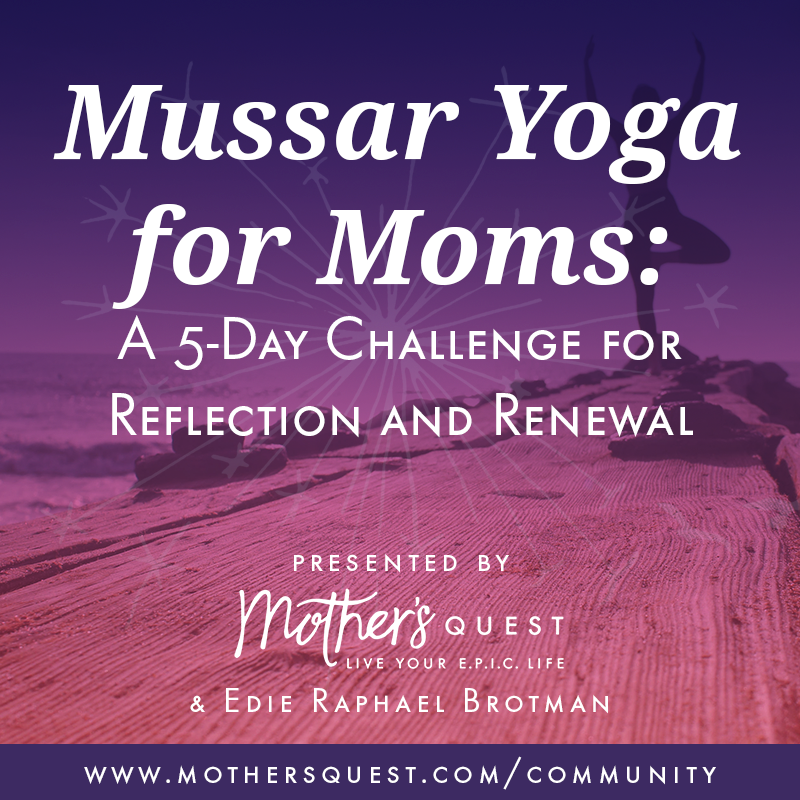 Join us for Mussar Yoga for Moms: A Mother’s Quest 5 Day Challenge with Edie Raphael Brotman using ancient practices to live more E.P.I.C. lives at the Mother’s Quest Facebook Group. 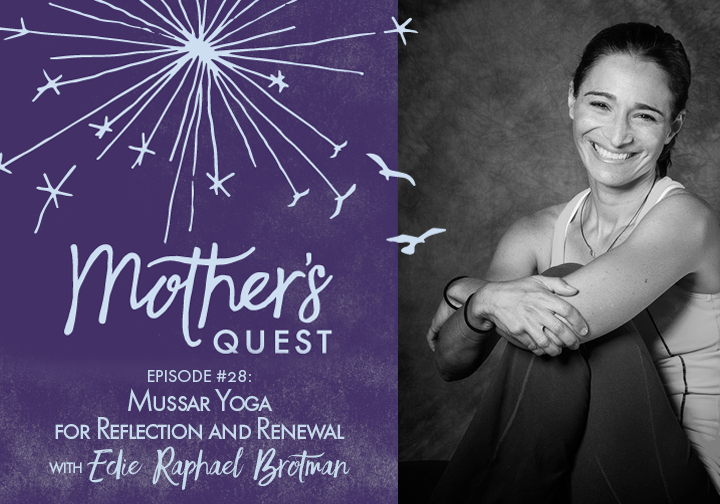 Listen to the episode and then make sure to join the Mother’s Quest Facebook group where we will poll the community to choose the “middah” or character trait that we’ll use in our 5 day Mussar Yoga practice starting Monday, September 25th. We’ll also have a live Q & A in the Facebook Group with Edie to check in on the Challenge on Wednesday, September 27th at 11 am PST.